As well as growing hops to brew beer, the Three Counties were famous for the cider and perry that came from the apple and pear orchards in the area. In this interview for the Midland Montage section of ATV Midlands News in 1960, the journalist interviewed Mr Savage, the fruitgrower, about orchard practices and some of the Wassail customs. Julia Letts, oral historian, recorded the speakers in this audio clip during 2016-2017 for Tales of the Vale, an HLF-funded oral history project in South Gloucestershire. The blog article lists the names of the contributing singers, speakers and cider-makers. In this recording, George Wright recalls how much cider he and his fellow farm workers drank during the day whilst working in the orchards in Earl’s Croome and Pirton near Pershore. Clue: It’s a lot! He also tells an anecdote about being paid in three-penny bits because the farmer hadn’t enough large coins. George was born in 1881 and was 74 when he was interviewed. This interview was recorded in 1956 with Stan Timbrell (b.1900, publican), and Charlie Long (b.1881, retired gamekeeper). Mr Ellis, the interviewer, has asked the men to remember how much cider the local workmen would drink during the hot harvest days when they mowed the hay by hand. Stanley Ellis interviewed the men at Slimbridge, which explains the loud sounds of geese and ducks in the background. Stanley Ellis carried out both of these interviews for the Survey of English Dialects. The recordings are now part of the British Library’s online Sound Archive. A light and sweet beverage, people often describe Perry as the second cousin of cider. It is a fermented, bubbly drink made from otherwise inedible pears and it has long been a speciality drink in the Three Counties. According to local legend, true Perry pears only grow within sight of May Hill in Gloucestershire. Perry is more difficult to make than cider and it fell out of fashion for a while. In recent years, local makers have revived the craft of making this charming drink and it is now much more popular. One of our contributing experts is the curator of the national Perry Pear collection in Hartpury and helped to create the collection at the Three Counties Showground. It’s not surprising then that this wonderful drink has featured in our project! George Lloyd describes to Stanley Ellis the process of making cider using a stone cider mill powered by horse. He describes the location of the cider mill in Weobley village, and how Sam the Horse used to enjoy the cider pressing. If Sam was left alone in the chase harness, he used to stop winding the mill and lick the cider bowl instead! George also describes the technique for laying and maintaining a hedge. He doesn’t give his age, but he sounds elderly and had probably retired by the date of the recording. Stanley Ellis made this recording in 1955 for the Survey of English Dialects. The recordings are now part of the British Library’s online Sound Archive. Not all of our cider characters are lost in the mists of time. 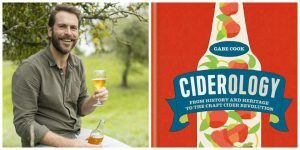 Gabe Cook hails from Dymock, Gloucestershire, and, with considerable experience under his belt, now travels the world on his mission to promote good cider. With his trademark moustache, he’s a very recognisable and lively ambassador for orchard products. Gabe provided the entertainment for our end of project celebration. Who knew that so many different ciders are produced in our project area? Since several of our Orchard Champions now making cider that list looks likely to grow! 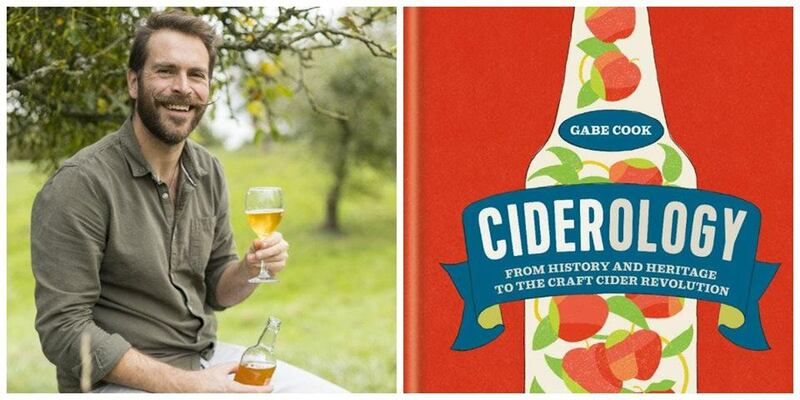 You can buy Gabe’s book – Ciderology – at independent bookshops and online. It is well worth a read!